[caption id="attachment_112201" align="alignright" width="300"] Marian Wood[/caption] Ivan introduced Sue’s longtime editor Marian Wood, who told the story of discovering Sue after receiving the first 60-pages of A IS FOR ALIBI. 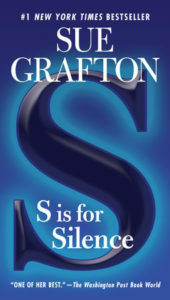 After devouring them overnight and initially receiving pushback from her publisher at the time, Marian and those of her colleagues who believed that Sue was something special pushed the Alphabet Series to mega-success over the course of thirty-five years, now with untold millions of copies sold around the world in twenty-six languages. Sue’s literary agent Molly Friedrich, together since B IS FOR BURGLAR, gave an emotional speech about her last visit with Sue just a few months before she passed. At the time, Sue was undergoing chemotherapy, but she still baked Molly a birthday cake from scratch. “I had assumed my birthday cake would be made by Liz Gastiger, their long-term chef and friend. But no, Sue had made my cake herself: a perfect lemon genoise with buttercream frosting,” Friedrich said. “There’s something so deeply moving about this beloved writer, not an ounce over ninety pounds, baking me a sublime birthday cake.” After Lucy Carson of the Friedrich Agency read a remembrance from Judy Kaye, the voice of Kinsey Millhone in the audiobook editions of the Alphabet, author and journalist Sarah Weinman shared what she loved about Sue’s novels: “Trailblazers don’t announce themselves upon arrival…The two qualities I appreciated most about Grafton were her loyalty, and her restlessness. She stayed true to Kinsey and the series conceit for her entire career, yes, but did not allow herself to stagnate, writing the same book over and over again…Sue Grafton died too soon, but she remained in control till the end. 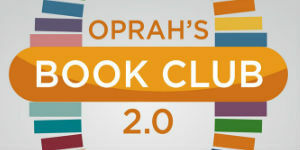 She had not begun writing the final book in the series, which was to be published in August 2019 as Z is for Zero. 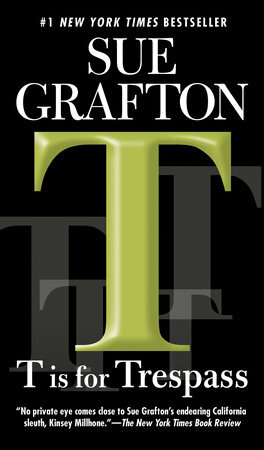 That leaves us with Grafton’s last published words, as always both ‘respectfully submitted’ and sharply delivered by Kinsey: ‘I’m not saying justice is for sale, but if you have enough money, you can sometimes enjoy the benefits of a short-term lease.’” [caption id="attachment_112200" align="alignleft" width="300"] Harlan Coben[/caption] Author Michael Connelly told heartfelt stories, then author J.R. Ward reflected on her friendship with Sue. They first met when Sue agreed to read her manuscript: “She had this bizarre thing where she’d read 50 pages of anyone’s work. The only condition was that you had to be willing to take her criticism. Years later, I would ask her why the hell she would do that, and she said, ‘Because the shitshows are even better than the good stuff!’ [When we first met to discuss my manuscript], she gave me more information in that hour than I had had about writing in the ten years that I was trying to get published.” Bird finished her speech by recalling the last time she saw Sue, at a holiday party late last year. “I thought I had more time,” she said. “And that’s the problem with life—you can’t see how few pages are left.” An emotional remembrance of Sue was delivered by bestselling author Harlan Coben, a fan of her books before they became close friends. “We all have people in our life who make every room better,” he began. “Every place that they happen to be in is just a little better because they were there. Sue was certainly one of those people … She was funny, she was biting, she was honest, irreverent, intelligent, warm, inquisitive, insightful. She was cutting, and most of all … she was generous.” Towards the end of his speech, Coben revealed that his “alphabet letters” tie included all of the letters except Z—a perfect tribute to Sue and her legacy, which he gave to Sue’s husband after the ceremony. [caption id="attachment_112203" align="alignright" width="300"] Steve Humphrey[/caption] Finally, Sue’s daughter Jamie Clark and her husband Steve Humphrey shared recollections of what Sue was like as a mother and wife. “I’m going to tell you a little about what my mother taught me,” Clark began. “My mother taught me about persistence, just by the way she lived her life. 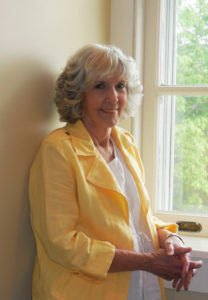 She wasn’t just an author, she was a writer. She wrote every single day. Rain or shine … My mother was a force of nature—not the destructive kind like a tornado or hurricane, but the gentle creative kind, like the spring sunshine that melts the snow and coaxes the flowers to bloom … For as long as there have been mothers and daughters, their relationships have been complicated. But not ours. Somehow, I lucked out when I stood in line for a mom. She was one of the best people I’ve ever known.” Humphrey began his speech by recalling how he and Sue first met, when they lived in the same apartment building. 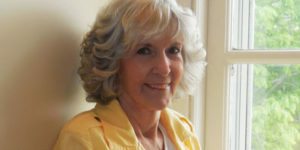 At the time, Sue was “a single mom raising two children … [She] and I had cats, and we would watch them play together in the courtyard between our apartments, her on the ground floor, me on the second, and make inane comments about how cute they were… That was the beginning of a forty-three year love affair. She adored me. I adored her. I consider myself to be infinitely blessed and fortunate. How many people get to find the love of their life at 23? And those of you who only knew her through her work, or only knew her professionally, really missed out. As brilliant as she was as a writer, and as disciplined as she was in her work, she was a much, much, much better wife, mother, friend and human being.” Following these heartfelt, funny, warm and sassy remembrances of Sue, the group toasted Sue’s life, work and friendship with some of Sue (and Kinsey’s) favorites: glasses of buttery chardonnay and triangles of peanut butter and pickle sandwiches. 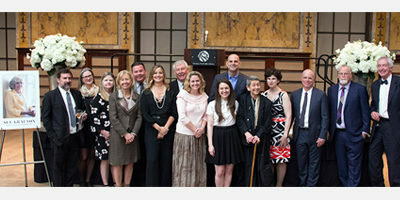 (c) Steven Humphrey[/caption] Anyway, here's to you, Sue. You're the best.” More remembrances came from the likes of C.J. Box, Robert Crais, Daniel Silva, Eric Jerome Dickey, Harlan Coben, Lisa Scottoline, Ruth Ware. Sandra Brown, Sara Paretsky, Jeff Abbott, Laura Lippman, Faye Kellerman, Debbie Macomber, Alafair Burke, and Meg Gardiner, to name a few. Sue and Kinsey will be remembered as international icons (both adored a peanut butter and pickle sandwich and a timeless black wrap dress) and treasured by millions of readers across lines of gender, geography, age, race, and creed. 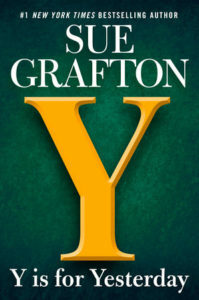 As Grafton’s daughter, Jamie, said in a statement on the author’s Facebook Page, “the alphabet now ends at Y.” A personal remembrance from Marian Wood, Sue Grafton’s longtime editor and friend: “In 1980, I got 60 pages of a manuscript. It was a snowy day and more bad weather was forecast, so I grabbed the 60 pages plus a couple of manuscripts and rode back to Brooklyn to enjoy a few snow days at home. 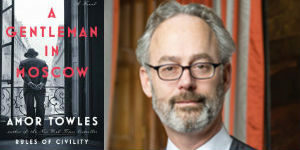 “I can tell you, I was stunned by those 60 pages. I wanted more. I wanted the whole book. I wanted to publish this amazing writer. “But there was an obstacle. 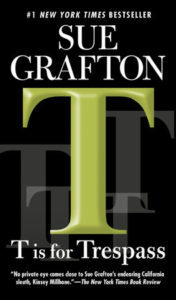 My publisher. “‘I don’t get it,’ he said after reading those sixty pages. Luckily, I had already given them to the marketing director, who did get it and we became a team, and the publisher caved. 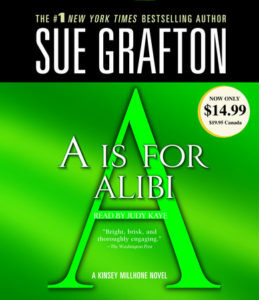 That was the beginning of A Is for Alibi. You might say the rest is history as the books took off and the market grew exponentially. “I’m a seat-of-the pants editor. When I read something and the bomb goes off in my head, I know it’s for me, I know it’s amazing, I know with backing, we can make it fly. And so it was with the alphabet series. And sales multiplied with each new book. 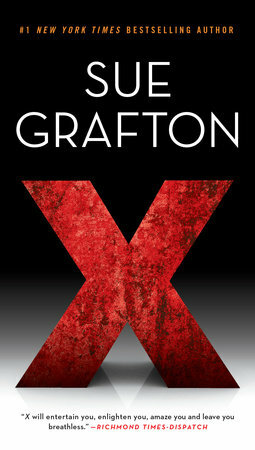 “Sue Grafton was a find all right. She was also an extraordinary human being. Already forty with a ton of experience being pushed around by movie personnel, all she wanted was control over her work—no interference from pseudo-smart twenty-five year old movie mavens. Books offered her that. Let me tell you, by the time we connected, she was a tough, smart, and dedicated craftswoman and also the most generous and kindest writer you could work with. 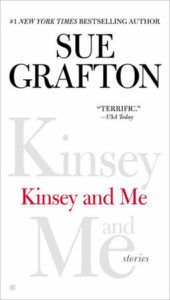 And so, for forty years, we worked and laughed and loved Kinsey. And so did the world it seemed. “In truth, it was a marriage made in heaven though the then agent could never have known that. In my youth, I loathed Nancy Drew and could not tolerate Agatha Christie. But here, in Kinsey, was my dream character: sharp, funny, vulnerable, and tough. And a little off the grid when it came to relationships thanks to an irregular childhood and an aunt who sort of raised her. This was a new kind of detective: a woman with quirks but also with a sense of herself, with empathy but also with street smarts. She opened a door for me and for thousands of women and, yes, men. It was a revelation how quickly men caught on to this oddball but terrific woman. She broke the gender barrier. There is a reason so many men and women named their daughters Kinsey over the years. 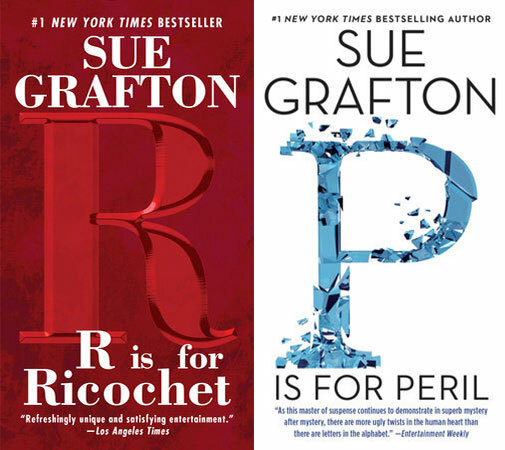 “Thank you Sue: You made a real difference in the lives of so many men and women even as you entertained us with so many wonderful and sometimes really scary books. “My good fortune increased by the time Sue was ready to take on the next letter. A Is for Alibi was selling like crazy, and Sue had gathered up her courage, left her agent, and took on Molly Friedrich, who has been with her—and me—since B Is for Burglar. I like to think we have made a really good team. “Sue died this December. She had finished the letter Y in the series. There will never be a letter Z. Just as she did not want anyone tampering with her work and therefore forbade any movies made from her books, so she made it clear there would never be a ghost writer. So with Y Is for Yesterday, the alphabet ends. "